My Keycon 30 Roundup: AKA Best. Con. Ever. But I’m going to stand by it. Keycon 30 was a multiple anniversary, celebrating thirty years of the convention, fifty years of Doctor Who, and 100 years of H.P. Lovecraft (In another anniversary of sorts, or at least a cool coincidence, I am celebrating my one hundredth post on the blog with this roundup). 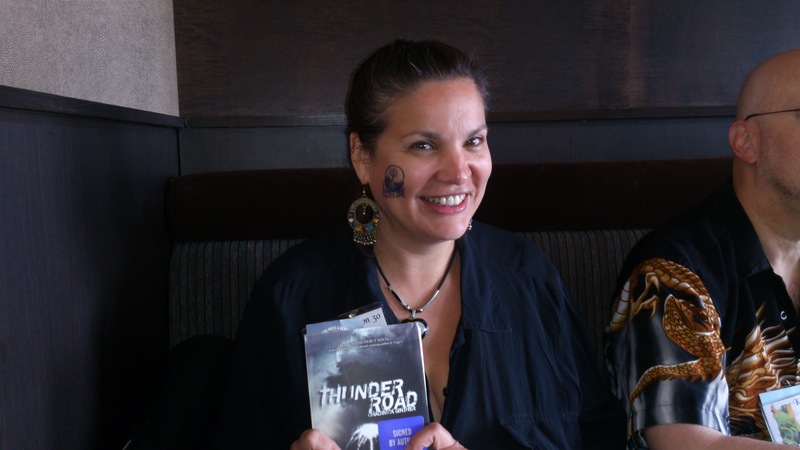 This was my first con with a book out (yeah, yeah, I know, World Fantasy and Pure Speculation were a part of my tour, but Thunder Road was just released then, and few folks had had the chance to read it yet). I was blown away by the number of people who came up to me to tell me that they loved the book. And I swear, I didn’t pay first time Keycon attendee, Shayla Elizabeth to sport a Thunder Road tattoo on her cheek all weekend. The only complaints I heard were about the brief period when the elevators had stopped working, but seriously, people complain about the elevators at every convention I have ever been to. And you can hardly blame acts of Cthulhu on the convention. This was the biggest and best Keycon I can remember. The guests hit on all cylinders, even the ones I wasn’t familiar with before the con. I didn’t see half of the folks I wanted to, and they time went by too quickly with those I did see. But I did make many great new friends. Hats off to Brian Mitchell and Levi Labelle, the 2013 ConChairs. They deserve your Aurora nominations next year. As does the programming team of Sherry Peters, Lindsay Kitson, Anna Lauder and Charlie Lauder. 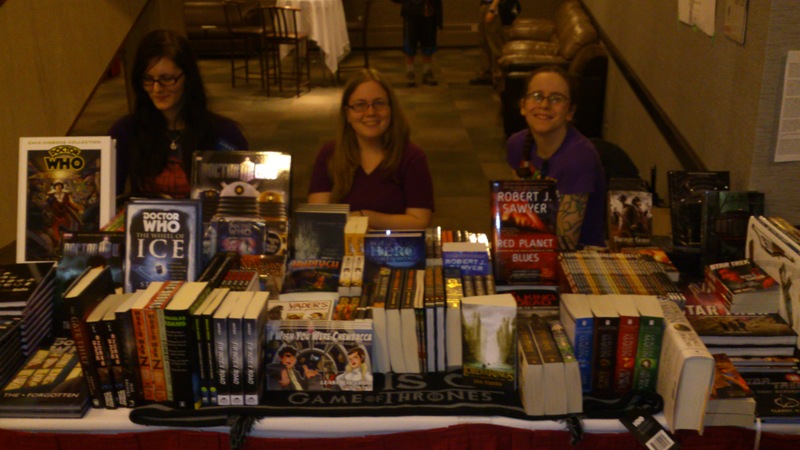 This year the book table was manned by some Chapters and Coles staff. I’ve tweeted about how awesome they were all weekend, but it deserves to be said again: Sydni, Stephanie, Dana, you ROCK! They knew their stuff (and knew my book!) and were lots of fun. I signed all the stock of Thunder Road they brought with them, and I hope to see them back at the con next year. I never get to see everything that I want to at any con. Invariably, one must see (at least, must see for me) panel is in conflict with another, but I particularly enjoyed Lee Moyer’s presentation on bad book covers and the crowdfunding panel Lee shared with Sylvia Moreno-Garcia and Steven Barnes. As for my side of the programming, I had a great time sharing a reading slot with David Annandale. We decided to tag team and trade off several short readings rather than each doing one long one. I think it worked well and kept our audience interested. David read from Gethsemane Hall, Death of Antagonis, and Yarrick: Chains of Golgotha. I read the openings from my short stories “First They Came for the Pigs” (natch, Silvia was my editor on that story) and “Back in Black”, finishing off the slot with the opening pages of the second book in the Thunder Road Trilogy, Tombstone Blues. Next up, I was moderating the Hour with an Author panel, featuring Author Guest of Honour, Ann Aguirre. Things got off to a slow start due to some location confusion (our original room had been partially flooded by a busted sprinkler head–R’lyeh Rising, terribly appropriate for a Lovecraftian Keycon) so I had a great chat with Ann before attendees filtered in to start asking questions. Ann is a great storyteller, and I’m in the middle of reading her Corine Solomon novels at the moment and really enjoying them (I’ve also been told that if you like Firefly you’ll like her Sirantha Jax novels–and I love me some Firefly, so I’m excited to start those too). Because our panel started late, we ended a little late, and Ann only had 45 minutes to eat before her next slate of programming started. Knowing from experience that the Radisson restaurant would not make that kind of turnaround, we hustled out of the hotel and into the rain. The closest restaurant was La Bamba, so yes, we took the author from Mexico City to eat at a Mexican restaurant in Winnipeg (her verdict: good–and more authentic than she usually finds in the States). My final panel was a discussion of Mythology and Folklore with Karen Dudley and Leia Getty. Technically, the panel was about the “reemergence of Greek and Norse mythology in fantasy fiction” but after talking about how those stories have never really gone away, we started branching out to talk myth in a more general way and about using it in fiction. It was a great turnout for a Sunday afternoon panel. I had a lot of fun. 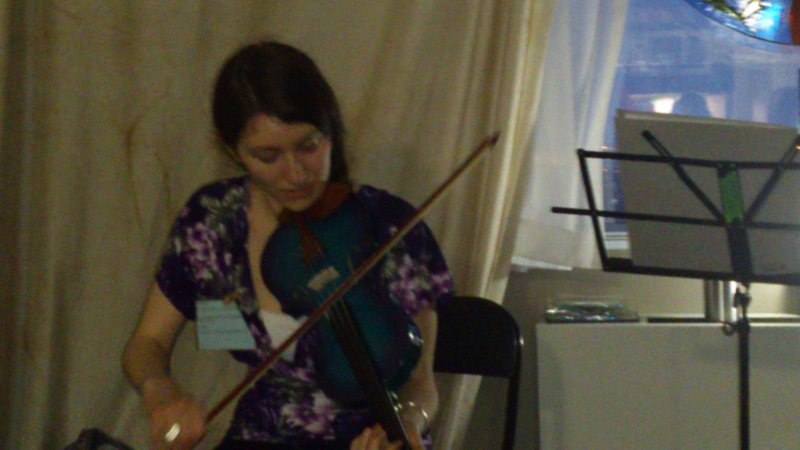 I checked out the Filk room, aka The Dandy Lion, run by Morva Bowman and Alan Pollard (who are nominated for an Aurora Award for their concert at FILKONtario 22) with Samantha Beiko and Clare Marshall. Clare rocked the blue fiddle she borrowed from Sam (the blue fiddle she was hoping to sneak home in her luggage) through a number of songs before Morva and Alan started their concert. I’ve never been much into the filk scene at cons, but I had a lot of fun. Things got a little meta when Canadian Author Guest of Honour, J.M. Frey read a fantasy short story set at a fantasy con during the Dead Dog party. Ryan Roth Bartel from Rampant Design made a custom mask for Lee Moyer. 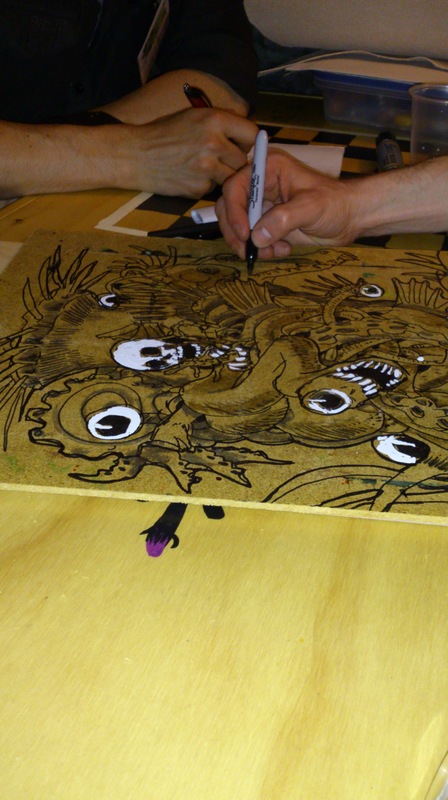 GMB Chomichuk drew a wicked version of Nyarlathoteph in his crawling chaos shape for Silvia Moreno-Garcia. I love Gregory’s work, and so to see him create an original piece was a treat I won’t soon forget. You can see the finished product in all its eldritch glory in Silvia Moreno-Garcia’s Keycon post. A whole gang of us spent the night of the Dead Dog in the Clockwork Club hospitality suite holding a seance that summoned only popcorn. Stories were told and plots were hatched. Oh, and we may or may not have formed a secret society. But I can’t talk about that. It’s a secret, after all. This entry was posted in Uncategorized and tagged Clare C. Marshall, David Annandale, Filk, GMB Chomichuk, Innsmouth Free Press, J.M. Frey, Karen Dudley, Keycon, L.T. Getty, Lee Moyer, Samantha Beiko, Sword and Fungus, Tesseracts, Thunder Road, Tombstone Blues, Turnstone Press, Writing by chadwickginther. Bookmark the permalink. Sounds like a lot of fun! Sorry I missed it all. I had a blast! Hope to see you there next year!